Ginex surfaces mankind’s development of the belief in one-universal God and a profound revelation by a Man of God. FOUNTAIN VALLEY, CALIFORNIA, UNITED STATES, August 1, 2016 /EINPresswire.com/ -- - Nicholas Ginex has authored many books and articles to reveal how mankind conceived the belief in one-universal God. Compelled to unveil the truth of man’s religious past, Ginex helps to direct mankind to a better understanding of their spiritual beliefs and live by the greatest command given by a Man of God – love one another. Upon reading facts and findings surfaced by gifted religious scholars and highly respected Egyptologists, Ginex is courageous to expose the truth of how an ancient civilization developed the concept of a soul, the reverence for truth, belief in many gods, a son of god, and finally, the worship of one-universal God. His accumulation of knowledge by reading the Torah, Gospels, Revelation and the Qur’an line-by-line has allowed him to “see” the big picture of how the Judaic, Christian and Islamic religions are all tied to the beliefs originated in Ancient Egypt. After writing several books on religion, Ginex was compelled to expose the Islamic religion for using Allah to incite bigotry, hatred, violence, and the murder of innocent people who have other beliefs. Defined by the dogma written in the "Qur’an and implemented with Sharia law," millions of Muslims have been indoctrinated to incite terrorism and the wonton killing of people with other religious beliefs. 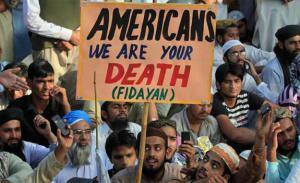 The figure with the sign "AMERICANS WE ARE YOUR DEATH" illustrates Muslims are committed to killing Americans. Islamic terrorism has reached a crescendo in our world today and is why Ginex is intent to inform all people that Islam is a threat to the world. In the book, Allah, We, Our and Us, Ginex presents the punishments, commands, and abominations in the Qur’an used by imams, caliphs and mullahs to indoctrinate the minds by Muslims. It is a challenge for religious followers to open their perspectives and accept the moral and spiritual beliefs introduced by our ancestors of an almost forgotten past. Religious leaders of the Judaic, Christian and Islamic religions have failed to credit the Egyptian religion for formulating many of the beliefs and commands they teach their followers. The inability to reveal the truth of Egypt’s greatest legacy, the belief in one-universal God, may be due to their ignorance of history or their egotistical belief that their religion has the only true God. What is significant about Amen, is that as the first universal God, He was emulated by the Hebrews, Christians, and Muslims by another name. But according to Jesus Christ, Amen is the beginning of the creation of God and therefore is the One-God. Are we to believe Jesus, a Son of Man, who many Christians revere as the Son of God, or are we to believe the words of religious men who wrote scriptures that are inconsistent and inherently contain myths and abominable passages that cause bigotry and hate? My dear people, Jesus announced the “Greatest Command” as a Man of God, Love One Another. Few people know Jesus stated this command emphatically three times in the Gospel of John. It is this one command, that if endorsed and followed by the worshippers of the Islamic, Christian, and Judaic religions there will be peace on earth. Those of you willing to pursue the truth of mankind’s development of the belief in one-universal God, I recommend you read a short article titled, “Amen, The Beginning of the Creation of God.” It provides a one-page figure that illustrates the development of the Judaic and Christian scriptures ending with Jesus revelation. But what can we conclude with this revelation? Major religious leaders claim they have the one true God. This is true. But they fail to acknowledge their God emulates, originated from, and is the same God AMEN. This article challenges religious leaders of the Judaic, Christian and Islamic religions to acknowledge Amen as >>the beginning of the creation of God<<. By doing so, they can work together to unify their beliefs to teach the Word of God – Love One Another. Related to this challenging effort, Islamic religious leaders >>MUST Revise the Qur’an with the Word of God<<. The 1.8 billion Muslims around the earth must force their imams, caliphs, and mullahs to incorporate >>Love one Another<<. This command and will lead the efforts to eliminate the abominable verses that advocate bigotry, hatred, violence and the murder of innocent people who have other beliefs. Your comments are welcomed and will be responded to on http://www.nicholasginex.com.